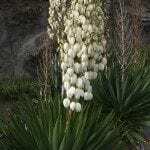 I have a large yucca tree. The new pups are doing fine and I don't want to transplant them but would like to cut off shoots that are very tall and thick. I want to let the pups fill in the middle of the yucca, but I don't know where to cut and whether I need root powder to help them before I put them in the ground next to the mother tree.